Prasmīgais cilvēks (Homo habilis) ir cilvēku ģints (Homo) pārstāvis, kurš dzīvoja aptuveni pirms 2,2 miljoniem līdz 1,6 miljoniem gadu, pleistocēna ēras sākumā. Sugas nosaukumu deva zinātnieki Marija un Luiss Līkijs, kuri atrada tā fosilijas Tanzānijā no 1962. līdz 1964. gadam. ↑ (angliski) New York Times article Fossils in Kenya Challenge Linear Evolution published August 9, 2007 says "Scientists who dated and analyzed the specimens — a 1.44 million-year-old Homo habilis and a 1.55 million-year-old Homo erectus — said their findings challenged the conventional view that these species evolved one after the other. Instead, they apparently lived side by side in eastern Africa for almost half a million years." ↑ (angliski) Richard Leakey describes the discovery and naming of the first habilis in The Making of Mankind, pp 65-66 of the Dutton 1981 hardcover edition. 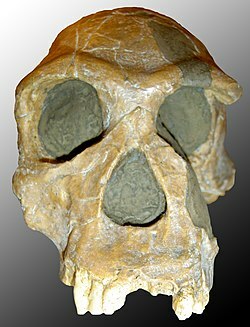 It was found by Jonathan Leakey at Olduvai, and was called at first "Jonny's child." Richard says that Louis named the fossil for its "ability to make tools" and that habilis means "skilful." By another account (see the notes for Louis Leakey) Louis solicited a name from Raymond Dart, which Phillip Tobias translated as "handyman." Later it became OH 7 described under "Famous specimens" below. Šī lapa pēdējoreiz labota: 2017. gada 26. septembris plkst. 20.47.